One more reason we could never export! Is the tacitly acknowledged correlation between campaign donations and access to legislators corruption? In the US we say "no." At least in the formal sense of legality. Yet simultaneously we decry the exchange of cash, often sunk into campaign gifting to influential constituencies, between politicians and business people in foreign markets. Corruption is endemic in business globally. Some of it is institutionalized, much of it is recognized. No matter where it occurs, it is a tax on business, and ultimately on the consumers who bear the costs that are embedded in product pricing. And it is a reality for American companies that explore global sales opportunities. The US Foreign Corrupt Practices Act outlines very stringent guidelines for global businesses. It has long arms (one of the largest enforcement actions under the FCPA was against Siemens, a German company, for it's corrupt practices in other markets) and significant consequences. Officers and directors of US companies have personal criminal exposure for actions of their employees, representatives and agents - even when they occur without their knowledge. And D&O insurance often specifically excludes individual defense coverage for FCPA enforcement actions. But most SMBs are simply unaware of the FCPA, and those that are familiar presume that it doesn't apply (since most companies don't sell directly to foreign governments where it is presumed, incorrectly, that most corruption would occur.) Every company which exports has interactions with foreign customs - and fascinating statistics indicate that more than half of all FCPA enforcement actions actually have a genesis in customs complications. If you are a business owner - it's not something to take lightly. Some simple, common sense steps can dramatically mitigate your FCPA enforcement exposure. Underpinning any program, though, must be a clear, unwavering, philosophical commitment to eschew any corrupt overtures by anyone. The FCPA offers some exceptions (small bribes to obtain local permits for instance) but they aren't clearly defined, nor have they been tested. There are certain things for which it's great to be known as a trailblazer, and then there are....you know what I mean. A capable advisor can help you quantify your risk, suggest steps to mitigate it, and offer a range of resources to support your efforts. It's simply not a viable excuse for ignoring the other 95% of the world's potential prospects! So corruption is a fact of global business, but not a barrier. Nevertheless, as you create target market profiles (you don't just sell to the latest lead, right? That would be "accidental" ad hoc exporting which is never a sound approach. You should select markets (region, country or even metro specific) according to a strategy!) one factor worth weighing is the prevalence of local corruption. 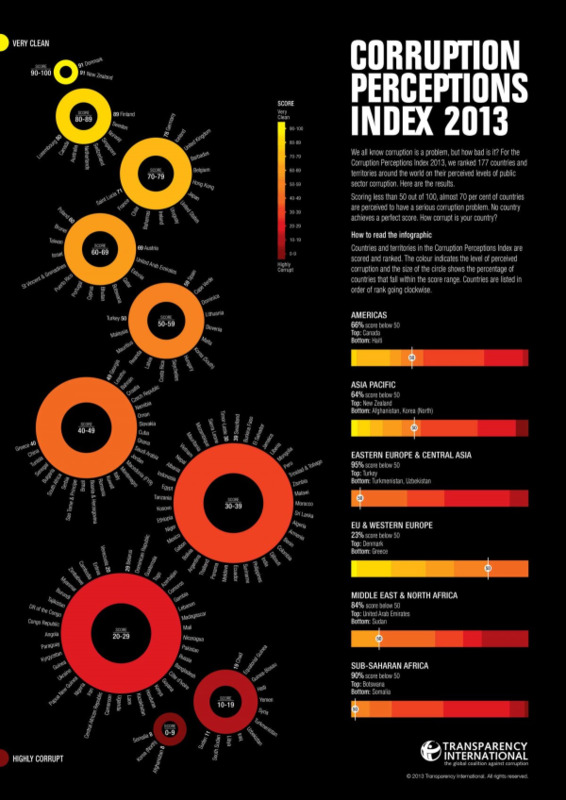 This great infographic provides a snapshot of Transparency International's 2013 data. Thinking broadly about how to maximize your global business development efforts? One element that is often overlooked is the important role of government relations - even for small business. Download our free eBook on the topic for more info!